1. Oxygen Humidifier provides high humidity to oxygen while using the bubble-type humidification process. 2. It contains a 4-psi safety relief valve, an O2 DISS female nut inlet fitting and a removable diffuser head, all of which are chrome-plated brass. 3. 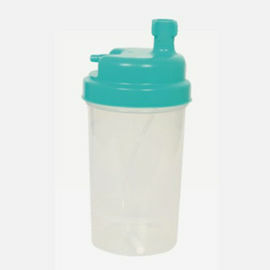 The polypropylene jar may be steam, gas or liquid sterilized and it is dishwasher-safe. 4. The Oxygen Humidifier includes the jar, lid assembly, sealing gasket and diffuser.